17 March 1914-17 October 1914: Entered Army service as a Fahnenjunker in Triersches Feld-Artillerie-Regiment Nr. 44. 17 October 1914-7 February 1915: Detached to the regimental staff of Field Artillery Regiment 44. 7 February 1915-28 January 1916: Battery Officer in the 1st Battery of Field Artillery Regiment 44. 28 January 1916-1 September 1916: Battery Officer in the 5th Battery of Field Artillery Regiment 44. 1 September 1916-27 February 1917: Ordnance Officer on the regimental staff of Field Artillery Regiment 44. 27 February 1917-21 November 1917: Adjutant on the staff of Artillery Commander 214. 21 November 1917-7 December 1917: Sick leave, in hospital, and transferred to the Replacement Battalion of Foot Artillery Battalion 7. 7 December 1917-1 February 1918: Assigned to the 2nd Garrison Battery of the Replacement Battalion of Foot Artillery Battalion 7. 1 February 1918-19 March 1918: Transferred to the 2nd Battery of the Replacement Battalion of Field Artillery Regiment 44. 19 March 1918-9 December 1918: Transferred to the General Command of the VIII Army Corps as 1st Ordnance Officer. 9 December 1918-30 September 1919: Transferred back to Field Artillery Regiment 44, while simultaneously retaining his position with the General Command of the VIII Army Corps. 30 August 1919: Separated from the Army. 15 October 1935-6 October 1936: Battery Chief in Artillery Regiment 16. 6 October 1936-26 August 1939: Battery Chief in Artillery Regiment 26 of the 26th Infantry Division. 1 November 1940-20 June 1941: Commander of the III. Battalion of Artillery Regiment 107 of the 106th Infantry Division in Germany. 13 May 1944-13 August 1944: Führer Reserve in the Army High Command. 13 August 1944-17 August 1944: Delegated with the leadership of the Grenadier Demonstration Division. 17 August 1944-9 October 1944: Delegated with the leadership of the 563rd Grenadier Division on the Eastern Front. 9 October 1944-9 November 1944: Delegated with the leadership of the 563rd Volksgrenadier Division on the Eastern Front (trapped in the Courland Pocket from October 1944). 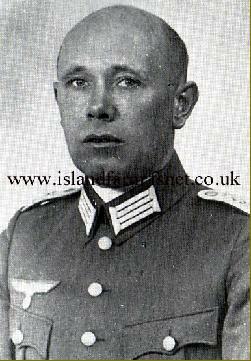 9 November 1944-25 February 1945: Commander of the 563rd Volksgrenadier Division in Courland. 19 April 1945-2 June 1945: Fortress Commandant of Stettin. 2 June 1945-19 June 1948: Prisoner of war in British captivity. German Cross in Gold: 14 April 1942, Oberstleutnant, Commander of Artillery Regiment 198. Commendation Certificate of the Commander-in-Chief of the Army: 27 February 1944, Oberst, Commander of Artillery Regiment 198. NOTE: As Generalmajor Brühl served in the police from 1919-1934, he does not appear in the interwar German Army Rank Lists that included officer decorations. Consequently, it is unknown if he received the Prussian Iron Cross 1st and 2nd Classes or other decorations during World War I. The hosts would welcome any additional information regarding the decorations held by this officer.